Whether you’re a huge football super fan keeping tabs on the NFL, a casual supporter of your local college team, or someone who’s knee-deep in their own fantasy football league, you should already know how much of a blast football parties can be. Sure, nothing beats buying tickets to an actual game and experiencing the tension and the energy coming off from the players and the crowd in person, but when it comes to enjoying America’s most beloved sport with your friends—without having to worry about excessive ticket costs, horrible seating, and getting stuck in traffic on the way home—then having a football party is the way to go. There’s also the fact that you get to enjoy football in extreme comfort too, instead of having to tolerate uncomfortable plastic seats and rowdy, noisy fans behind and in front of you. There’s a catch when it comes to football parties, though. They’re only as good as the hosting venue. While you can definitely have a great football party in your home or man cave, you can bump up the quality several notches by hosting the party somewhere memorable. Somewhere with huge plasma TV screens, first-class amenities, great food, and gorgeous girls, in a city that’s globally-renowned as the entertainment capital of the world. 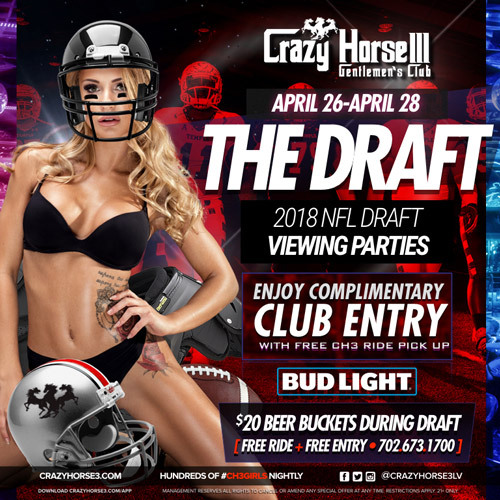 Yes, we’re talking about holding your football party in none other than Crazy Horse 3, the top gentlemen’s club in Las Vegas, Nevada. Doing so will not only give you the luxurious and satisfying football party experience that you’ve been looking for, it’s also going to be the one that you and your friends will always remember—that is, until you hold another one with us. If football really isn’t your thing, but you’re curious what all the fuss is about, check out our football primer in the appendix! Finally, there’s also Fantasy Football, where you and your friends create dream teams made out of players from a specific league. You then pit your teams against each other by keeping track of your players’ real-life performances throughout their league season. The more points they score in a game or how well they do, for instance, means that their fantasy equivalent in your team is also scoring those points for your team. At the end of the season, everyone tallies up their dream team’s points, and whoever gets the most points wins that season’s fantasy football league championship. Just like with any other game, you can make things more exciting with a cash prize, as well as making a party out of the “drafting” process and the final tallying-up. If it sounds vaguely like some sort of football tabletop or video game, in a way that’s exactly what it is— but unlike in those games where the experience is more self-contained, fantasy football involves the real-world progression of the sport in its mechanics. So it allows you to enjoy football with an added layer of interaction and investment, besides just rooting for your favorite team and hoping they win the championships. So that’s it—football and why it’s the most beloved sport in America. Now let’s explore why you shouldn’t just confine yourself to your man cave or your friend’s house when you’re holding a football party. Why Go to Las Vegas to Celebrate Your Love for Football? Now, you may be wondering: why Las Vegas specifically? After all, it’s not the first thing that comes to mind when you think about where to enjoy a sporting event that isn’t boxing or mixed martial arts. Besides, the only time you go to Las Vegas is either for a bachelor party, or if you’re feeling like testing your luck with gambling, right? While we’re not saying that isn’t true, we’re not saying it is, either. Yes, the so-called Sin City may seem like a weird place to enjoy football, but there are a handful of pertinent reasons why you should try doing so for your next major gridiron-related party. First off, Las Vegas isn’t known as the entertainment capital of the world for nothing. There are a lot of other things to do in Vegas other than just attend football parties! Not only can you enjoy the famous sights of the City of Sin that’s been made famous by many Hollywood movies, but you’ll also be able to partake in many activities that you may have only dreamed about. For instance, you can try your luck at one of the many impressive casinos dotting the city’s landscape and main strip. If you’re itching for a memorable performance, you can catch an A-list celebrity concert or a magic show featuring some of the best names in the business today. In the mood for something more laid-back and educational? Then explore one of the many museums dedicated to the city’s rich history, from its origins to its movie-famous criminal mob underpinnings. Finally, if you’re eager to take a walk on the wild side and enjoy the nightlife that only Las Vegas can offer, then you have your pick of the city’s premium-quality nightclubs, stripper clubs, and gentlemen’s clubs to choose from. Football is awesome, sure, but let’s be real here: it’s not all that you’re going to want to do or think about during your party. In Las Vegas, you have a limitless number of options to entertain yourself and your friends with. When it comes to accommodations, Las Vegas is no slouch. If you’ve got the budget for it and you want to be treated like royalty, then the Sin City has you covered. Take your pick from any of these world-class and celebrity-endorsed hotels: the MGM Grand, the Bellagio, the Mandarin Oriental, the Palazzo Resort, and many more. Each and every one of them are easily accessible within the city and offer only the best when it comes to making you comfortable during your stay. If you’re looking to save a buck or two, though, then don’t despair: seasonal promos, deals, and sales on rooms for those big-name digs are always popping up every now and then, especially in the summer. Besides that, there are also quite a handful of hotel chains in Las Vegas that offer premium accommodations for a more wallet-friendly price. Nothing can spice up a football party more than having the company of hot, clever women who look more in place in a supermodel catalog than anywhere else. Wherever you go in Las Vegas—especially if it’s in a gentlemen’s club like Crazy Horse 3—you’re guaranteed to encounter some delicious arm candy who’ll not only entertain you with her looks, but also with her intellect and personality. If you play your cards right with enough class and gumption, then you might just get lucky in the City of Lights—and we’re not just talking about your fantasy Football league scores! Those are just some of the more pertinent reasons why you should definitely consider hosting your next football party in Las Vegas. Now it’s time to get a bit more specific and delve into just where in Las Vegas you should be booking—namely, the prestigious gentlemen’s club Crazy Horse 3. Let’s cut to the chase here. Crazy Horse 3 is no mere gentlemen’s club, nor is it just one of those seedy stripper clubs that rob you blind after a few dances. It’s the one place in Las Vegas that condenses and refines all the best that the entertainment capital of the world has to offer its visitors, from the lights to the glamour to the girls, and packages for you to enjoy. It’s luxurious and excessive in all the right ways—ensuring not just a perfect football party but also the time of your life. Crazy Horse 3, above all else, wants its guests to feel like they’re in a true gentlemen’s club rather than a seedy place for working girls to dance and earn tips in. As such, we enforce one of the strictest dress codes in Vegas, that being all guests are required to wear only upscale or fashionable attire. No wife beaters, flip flops, baggy pants or sports jerseys allowed—our bouncers won’t let you in no matter how much you complain or shout. We also take rowdy or drunken behavior very seriously. Just because we’re offering world-class quality alcohol doesn’t mean we endorse getting so drunk that you end up starting fights or throwing up all over the floor. If our staff, girls, or bouncers see any misbehavior from our guests—due to inebriation or otherwise—they’ll be promptly escorted out of the premises, no questions asked. Yes, we know that it does sound a bit strict, but it’s all to make sure that you can enjoy your football party in peace, prestige, and luxury. Nothing ruins the party—or the mood—more than having some rude customer start up a ruckus within earshot, after all. 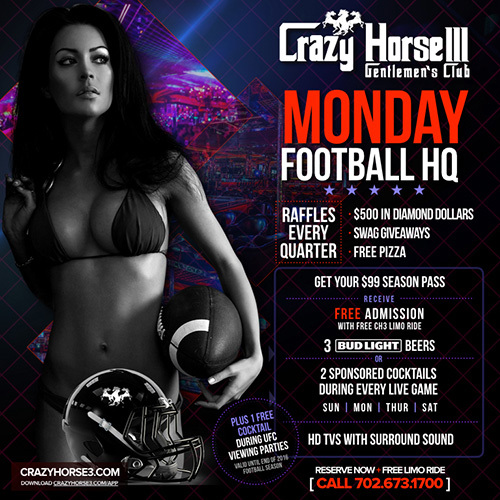 What’s better than enjoying your football party in a high-class joint like Crazy Horse 3? Why, getting driven there in complete luxury, of course! Crazy Horse 3 is one of the few gentlemen’s clubs in Las Vegas that offer free ride service to its patrons, one that’s completely free of charge. Yes, you read that right—absolutely free! Just ring us up in advance –preferably 24 hours before—and we’ll schedule your pickup time and location. No more arriving in a dingy taxi or scuffed-up rental for you and your football buddies. 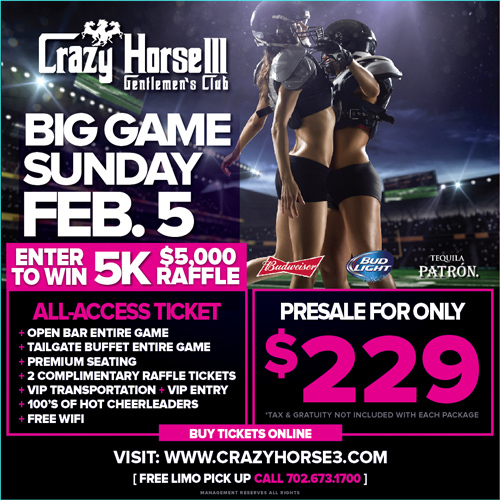 You’ll be driving up to Crazy Horse 3 in true Las Vegas style with us! Plus, our ride service also guarantees you free VIP entry to the club, so you don’t have to wait in line like everybody else. Just remember to tip our driver before you get off. 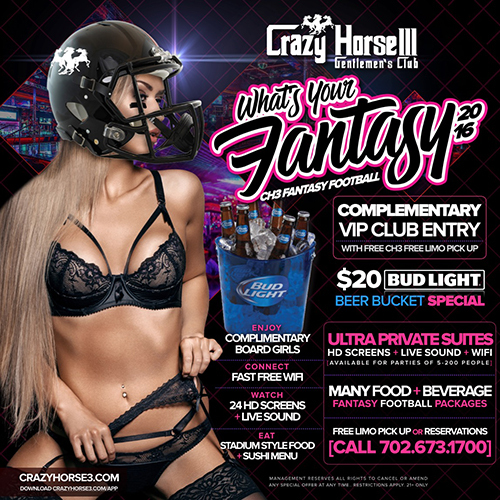 We’ve put a lot of money and resources into making sure that Crazy Horse 3 is the perfect place for you to enjoy the finest that Las Vegas has to offer, whether you’re here for a fantasy football draft party or you simply want to have some stellar female company for the night. Our main room, for example, features not just a cascade of large HD plasma screen TVs—perfect for enjoying the latest and greatest football matches with—but also a grand fifty-foot bar where only the finest drinks are served. You’ll be entertained and sauced in the kind of style that will make even James Bond jealous. If you desire to take the party somewhere a bit more private and intimate, then our luxuriously furnished VIP room with its private suites should be your next destination. Did we mention we also have free and fast Wi-Fi? Yes, it isn’t just free, but it’s also wickedly fast. Perfect for checking potential fantasy football team draft picks at a moment’s notice. A party isn’t one without delicious food and great alcohol, so naturally, we made sure that we have both in spades. Get your fill from our very own Crazy Horse cuisine that we’ve dubbed ‘Oral Treats’— premium-quality grub that’s perfectly portioned to be easily picked up by hand and popped into your mouth. No need to pick up a spoon and fork, just use your fingers! Choose from our wide and colorful variety of sushi as well as our deep-fried fare of bar favorites like fries, onion rings, chicken fingers, calamari, and others. Hungry for something a bit more substantial? We’ve also got a range of entrées for you and your football buddies to enjoy, such as our own spin on sandwiches, burgers, pizza, and hot wings. Be sure to check out our all new menu! What about the booze? Why, only the finest for our customers, of course! You get access to all our top-shelf drinks, from our exotic beers to our premium vodka cocktails. Whether that last-minute touchdown or ridiculously painful-looking tackle calls for a swig of Dom Perignon or a shot of Stolichnaya, we’ve got you covered. We’re not exaggerating when we say that we have some of the finest-looking female entertainers in our employ at Crazy Horse 3, with all 250 of them waiting to meet you and your football-loving posse. By choosing us to host your fantasy football draft party, you get exclusive access to our girls’ time and company, and they’ll be doing all they can to make sure you’re having fun during your stay. If you’re concerned about whether you’ll actually be able to hold a conversation with them and not just spend the rest of the night in awkward silence, don’t be—all of our girls are smart and wonderful conversationalists. Just talk to them, and be yourself. They’re there to make sure that you feel welcome in our club, after all. With such an amazing value, you’d be crazy not to host your football party with us! Call us now, and book your party. You won’t regret it! Before we leave you, though, here’s one last bit of advice, and it has to do with running an absolutely unforgettable fantasy football party. Nothing ruins a party harder or faster than finding out that the space you’re doing it in is too small. Remember that everyone is going to be socializing and walking around while also drinking and eating. Fantasy football drafts are long and drawn-out affairs, so pace yourself—you have the entire night ahead of you. You also have to keep your wits about you the entire time, as you ARE essentially playing a competitive game with your friends that requires strategy to win. Stick to beer until all the picks have been made. Afterward, you can go crazy. This applies even if you’re the host—as long as you’re participating, you’re a competitor, and therefore not neutral. Having a neutral party read out the picks and take care of the draft board as well as the draft clock means that everything is fair and impartial—nothing that will make your friends suspect that there’s some underhanded stuff happening. Besides, it leaves you free to socialize and drink with the rest of your friends! You can’t expect everyone to stand or sit down on the floor for the duration of your party. That’s just crazy! Ensure that your location has enough seating for everyone and that the seating itself is comfy and luxurious. This means stocking up on everything a fantasy football draft needs, such as notebooks, index cards, pens, and draft sheets. Even if you tell your friends to bring their own, assume that they’ll forget or just misplace theirs, so bring enough for everyone in advance. Nothing can slow down the action more than someone needing to go to the bathroom in the middle of a draft. Worse, an ill-timed one can ruin the mood completely, resulting in an awkward draft party. To reduce the chances of this happening, announce communal break times or sessions so that everyone has a chance to relieve themselves. This way, things are kept moving at a steady clip without any unexpected or annoying delays. Have fun. You’re in Las Vegas! Sure, you’re in a fantasy football draft party, but that doesn’t mean you have to be so stiff and upright about the rules. Have a few girls participate or offer their opinions about your picks, or mix up the action with some playful drinking games. Don’t worry about the cleanup later—all you have to do is pay the bill and leave! 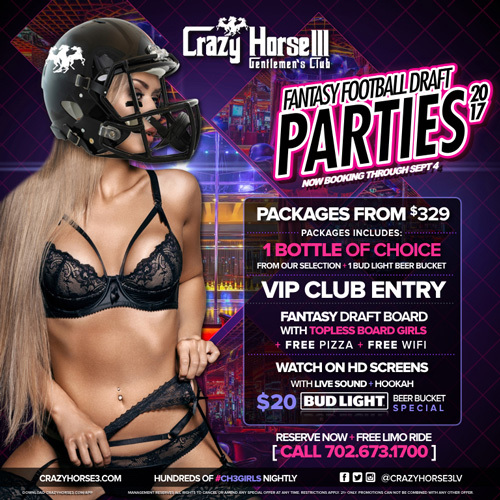 If you’ve only been holding your football parties at home, whether it involves your college team’s try at the championship, your neighborhood fantasy football draft, or even the Super Bowl, then it’s high time for you to experience football like never before by taking it to Crazy Horse 3 in Las Vegas. Make the trip, and take the time. You and your friends have earned it! During the football season, there’s always a game. We’ve got Monday Night Football, Thursday Night Football, all the Sunday day games and Sunday Night Football. Not to mention a College Game jammed in anywhere they can get a good rating, and of course all day Saturday NCAA football games. As you can see from our past events, we throw a football party for pretty much every occasion, and sometimes just because! Before you get too deep into the many reasons why you should be holding your next football party with Crazy Horse 3—whether it’s to celebrate your college team winning, or watching a particularly fun NFL Preseason matchup, or even the granddaddy of them all, the Super Bowl—let’s have a bit of a refresher on just what football is, and why it’s so popular nationwide. While we may all be familiar about everything that has to do with football, some of our readers may, in fact, be completely new to the sport, or at the very least confused as to why we’re all so obsessed about it. If you’re reading this, and the latter applies to you, then read on as we’ll try our best to give you as detailed a backgrounder of football. If you’re a football fanatic like us, then keep reading as well, as you might find out something about this awesome sport that you may not have known about previously. So, what is football? To the uninitiated, football may seem like a bit of a strange departure from what the rest of the world knows as football, namely soccer or association football. It may even be considered as a misnomer, as most of the time the players are carrying, throwing and catching the ball with their hands, rather than in soccer where the main method of interacting with the game ball is through their feet. They wouldn’t be exactly wrong here, but there’s actually a historic reason why football is named as such. American football is actually a kind of combination of two sports, namely soccer and rugby. Before the first set of intercollegiate football rules was drawn up by Yale, Columbia, Princeton, and Rutgers in 1873, the different colleges in the United States played their own brands of mob ball games in which players attempted to advance the ball across the field and into a goal area. The initial rules were based largely on those of the Football Association’s soccer, while rules from the more recently established Rugby Football Union were incorporated in many other collegiate games in the years that followed, particularly those initially played by Harvard, McGill, and Tufts. In these games, the act of carrying the ball—a feature of rugby—was permitted. More rule changes and revisions would come over the years until the sport that we know of and love today would be realized. The basic gist of a football game is as follows: it’s a team sport that’s played by two teams of eleven players each, on a rectangular field with goalposts at each end. The objective of the game is for the offensive team to try and get the ball from one end of the field to the other, either through players throwing the ball to one another in a series of passes or through one player simply running with the ball until he reaches the other end. The defending team has to try and stop the offense’s attempts, usually by tackling the player that currently has possession of the ball or taking control of the ball themselves. The offensive team has four attempts, or ‘downs,’ to try and make progress with the ball. If they advance ten or more yards toward the defending team’s goal line at the end of the field, they get four more downs. If not, they switch roles with the other team, becoming the defense. Points are awarded whenever the ball reaches the opposing team’s goal—i.e. a touchdown—or the ball is kicked through the opponent’s goalposts in what is called a field goal. Whoever has the most points at the end of the game wins. First, there’s the fact that its team-based sport, which always makes for a more visually exciting and active sport. You have a lot of players in the field, and so there’s a lot more activity—a lot more intensity. There’s also the fact that it’s always more exciting and inspiring to watch a team working together compared to a single athlete. Second is that it’s a very physical game. Football players, especially those playing in the collegiate and professional levels, have to be in top physical form to compete. They not only have to be able to run and move quickly in order to get the ball far into the field, they also have to have sharp reflexes and even sharper hand-eye coordination to toss and catch the ball, while also avoiding being tackled or countered by the other team. The tackling itself, when it does happen, can be very violent and brutal, with injuries and concussions being very common. It all adds to the visual spectacle of the game, making it a treat to participate in as well as watch. Third is that mechanically and rules-wise, it makes for a very intense and watchable game throughout. There is no downtime in the game when the ball is in play—the offensive team is fighting to make every play count, while the defensive team is doing all they can to ensure that the ball stays nowhere. It’s a setup that makes for a lot of conflicts, ensuring that every game will pit each team’s best efforts against each other. Finally, and this is most likely the most important—there are multiple ways to enjoy football. For instance, if you like football that features young, up-and-coming athletes trying to carve a name for themselves, you can get into College Football, where American universities, colleges, and military academies duke it out for the national college championships. While college football games may not be as hyped or as professional as its more moneyed counterpart, there is still a lot of heart and physicality in them. You also have your pick of teams to support, with more than 777 teams representing this entire league of football—and that number can only get higher with every year! If you only want to enjoy football being played at the ultimate level, then you should definitely follow the National Football League or NFL, with its preseason matchups and seasonal playoffs pitting the 32 finest teams in the country against each other. The NFL also hosts the annual Super Bowl—a massive sporting event that makes the entire world stop and pay attention whenever it comes around. Not only do tens of thousands of people attend this one huge event in person—filling up the stadium to near-bursting capacity every time—but more than 100 million viewers in America also tune in to watch through their TVs. Millions more stream it live on the Internet. Revenue-wise, it’s one of the biggest in the business, with each Super Bowl generating at least over US$600 million in revenue whenever they come on. Wow!